Wow! I know it's Christmas and everyone is busy, but I really need to learn to say "no." I had gotten myself into a few too many things this last week, so I've been a little remiss in posting. I'll try to catch up here in the next couple of days. 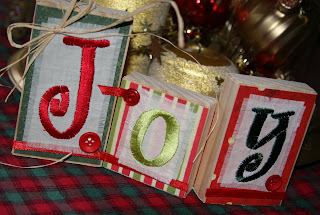 On Saturday, I made 20 of these simple wooden joy banners for a party favor and I thought I would share with you how to make them. First, I needed some wood. I went the inexpensive route and purchased a 1x3 from the lumber store and cut it into the sizes I needed. It was great wood so I needed to sand it very little, just around the edges so they didn't poke anyone. I needed 3 pieces in varying heights. Mine were about 4 1/4", 3 3/8" and 2 1/2", but there isn't a need to match mine exactly. 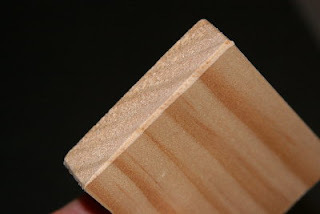 Depending upon where/how you get your wood, if yours isn't smooth, you'll probably want to sand it a bit. 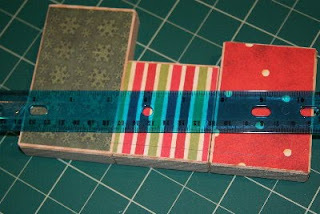 Next, I cut some papers to match the sizes of the blocks. I made mine just a little smaller so you could see the edge of the wood. I used 3 different coordinating papers. 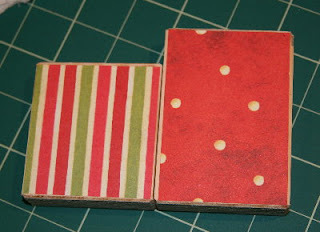 Next, I glued the papers to the blocks. I used spray adhesive because I had lots to do and it was quicker, but any glue will work. Next, I prepared my letters. 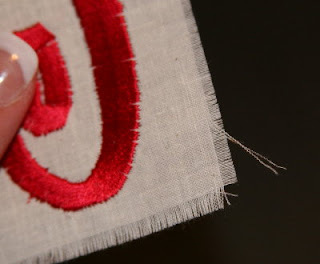 I embroidered mine onto muslin. 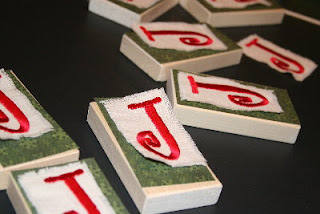 I thought it would also look nice to stencil the letters onto burlap, to use vinyl lettering, or even have your child write out the letters in crayon -- whatever option is available to you. 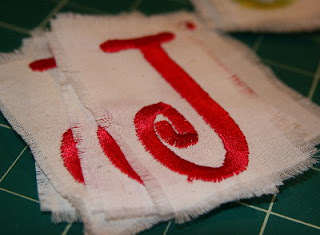 I finished the edges of the letters by fraying out the fabric just a bit. 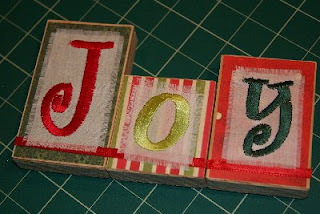 I made the letters slightly smaller than the paper on the block. 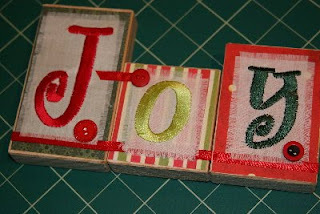 Next, I set up the "hinge" for the first set of blocks, which is really the last two -- "o" and "y." 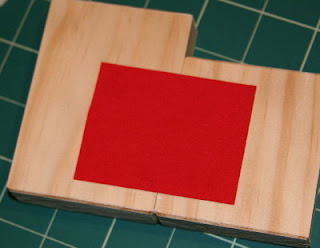 I began by flipping over the two smaller blocks. 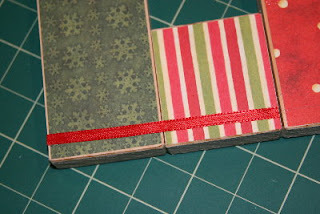 For my first set, I used some small strips of ribbon to match the front. But it isn't really seen when it's finished and didn't seem to be as stable, so I used a single larger piece of felt ribbon for the rest instead. 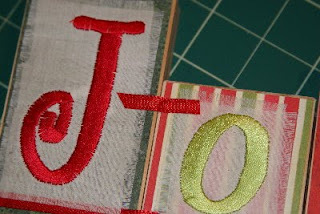 You can use fabric, ribbon, or even a real hinge if you have one on hand. 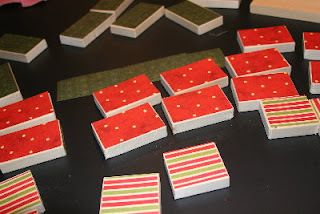 Be sure of your block placement -- you're doing the back, so the sizes need to be arranged backward too. When I flipped it over, it looked like this. Next, I took a ruler and drew a line all the way across the bottom. 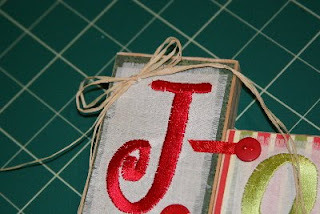 This was my a guideline for where to place the glue and ribbon. 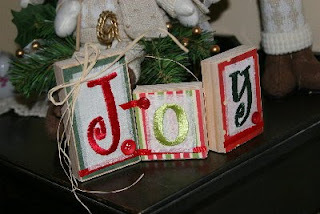 Then I added another separate piece of ribbon to the third block so the ribbon just blended in with the hinge ribbon. If you happen to have a sharp razor blade on hand, you can do all 3 blocks at once, then cut the ribbon between the 2nd and 3rd block with the razor blade. Next, I applied the letters. I used spray adhesive for this step too. (I have a real love/hate relationship with spray glue.) It didn't matter if I overlapped the ribbons. 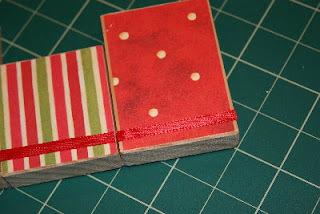 Next, I applied a short strip of ribbon near the top of the middle block for the upper hinge. I added a button to the end of the upper hinge, as well as a couple others into the corners for decoration. And last, I tied a piece of raffia into a bow and glued it to the top corner of the first block. ... or wrap it up to give to someone for Christmas. They'll love it! Especially since you made it yourself. Let me know what you think! 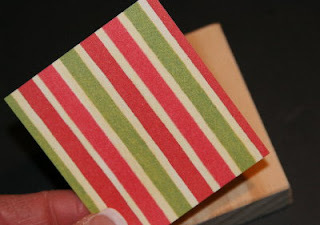 Check back tomorrow for another wood project that I think you'll like too. 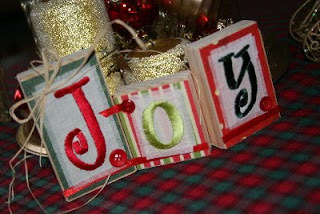 And don't forget to check out the endless list of inspirational ideas at my home page childmade.com.